‘I simply could NOT read this book. It is like a peculiarly dull sermon’. In his next entry, Thomas spends his Easter weekend reading ‘Mein Kampf’. 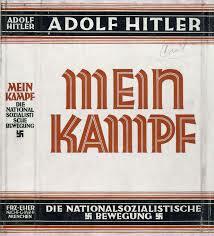 In 1925, Adolf Hitler published his autobiography Mein Kampf (My Struggle). The work was written whilst Hitler was imprisoned but became a success in 1933 as Nazi Party rose to power. The book unsurprisingly did not resonate with Thomas! ‘It is wearisome stuff’ writes Thomas. 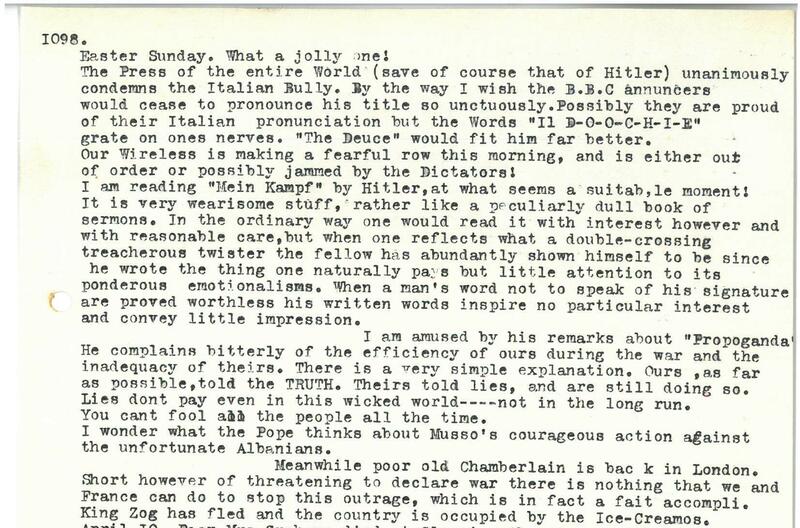 Thomas’s main issue with the work is that the narrative pushed by Hitler simply does not work as Hitler has shown himself to be a ‘double-crossing treacherous twister’. He continues by stating that ‘When a man’s word not to speak of his signature are proved worthless his written words inspire no particular interest and convey little impression’. 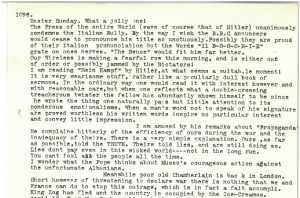 Curiously, Mussolini agreed with Thomas and was critical of the book. He stated that it was a ‘boring tome that I have never been able to read’ and was ‘little more than commonplace clichés’. Mein Kampf covered a variety of beliefs that continued on into Nazi Party policies. This included anti-Semitism and the threat of the Jewsish people to German state; the need to destroy the parliamentary system and replace it with a dictator; and the need to expand into different territories to accommodate a growing population. One of the most infamous views in the book is the need for a German Aryan race. Thomas describes this as ‘Whole pages of nonsense’ and that ‘scientific biologists have long ago concluded that there is no “pure” white race’. Thomas ends this entry by changing topic and noting that talks of evacuation have begun to appear. He ends by saying ‘Far better to get the children away now and be done with it’.